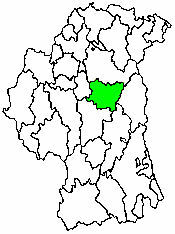 MULLAGHBRACK, a parish, partly in the baronies of ONEILLAND WEST and LOWER ORIOR, but chiefly in the barony of LOWER FEWS, county of ARMAGH, and province of ULSTER; containing, with the district parish of Kilcluney, the post-town of Market-hill, and the village of Hamilton's-Bawn (all of which are separately described), 16,099 inhabitants, of which number, 7627 are in the district parish of Kilcluney. This parish is of great antiquity; mention is made of it in Pope Nicholas's Taxation in 1291, at which time the rectory and several townlands belonged to the Colidei, or Culdees, of Armagh. At the plantation of Ulster, James I. granted 1000 acres of land here and the manor of Coolemalish to H. Acheson, Esq., who built a stone bawn at Carrickbane, 140 feet long and 80 feet wide, defended at the angles by four towers; and settled there 19 Scottish families, who, with their servants and retainers, furnished 30 armed men for the service of the king. Soon after, Sir James Douglas obtained a grant of 2000 acres and the manor of Cloncarney, on which his successor, Sir Archibald Acheson, built a strong castle and placed 36 British families, who furnished 148 armed men. He also built a town round his castle of Cloncarney, in which he placed 30 more British families, who provided 30 soldiers for the king. This town was the origin of the present flourishing town of Markethill, and the family of the Achesons were ancestors of its present proprietor, the Earl of Gosford. The parish is situated on the road from Armagh to Newry, and comprises 24,296 statute acres: the land in the northern part is of good quality, but that in the south-eastern portion is mountainous and poor. The system of agriculture is rapidly improving; there is no waste land, and very little bog, not at all sufficient for a due supply of fuel for the population; lime, which is brought from Armagh, is the chief manure. Lead ore of rich quality is found in the townland of Cavanaghgrough or Cavanagrove, but no attempt has been made to work it; and near the R. C. chapel at Drumlack is a thin seam of excellent coal. Gosford Castle, the seat of the Earl of Gosford, is a sumptuous and stately structure in the Norman style, built of granite from the Mullaglass quarries: the castle has been 17 years in progress of erection, and is not yet completed; it is situated in an ample and highly improved demesne, about a quarter of a mile to the east of the former mansion, which was built on the site of the castle originally erected by Sir A. Ache-son in 1617, and destroyed in the insurrection of 1641. The other seats in the parish are Drumart, that of J. Hardy, Esq. ; Marlacoo, of R. Boyd, Esq. ; and Ballynewry, of B. Atkinson, Esq. A court for the united manors of Coolmalish and Cloncarney is held on the first Wednesday in every month, for the recovery of debts under 40s. ; and a court for the manor of Johnstown is held at Hamilton's-Bawn, on the first Monday in every month, for the recovery of debts to the same amount. Part of the parish is within the manor of Armagh, and part also in that of Clady, for which courts are occasionally held at Cambough and Clady. Courts leet are also held twice in the year. Several townlands are tithe-free, and the townland of Derrynaught was given by Primate Robinson to the Armagh Observatory. The living is a rectory and vicarage, in the diocese of Armagh, constituting the corps of the prebend of Mullaghbrack in the cathedral of Armagh, and in the patronage of the Lord-Primate. The tithes amount to £671. 4. 6 ½.; the glebe-house, a handsome residence beautifully situated, was erected in 1829, by the Rev. S. Blacker, LL.D., the present incumbent, at an expense of £4651. S.; the glebe, which consists of five townlands, comprises 1146 statute acres, valued at £1416 per annum. The church, a neat edifice near the castle, was rebuilt in 1830, at an expense of £1787, of which £1035 was defrayed by the incumbent, £200 by the Earl of Gosford, £100 by the Lord-Primate, £32 by subscription, and £400 by parochial assessment. In the R. C. divisions the parish is partly in the union of Ballymore, and partly in that of Kilcluney: the chapel, situated about half a mile from the church, belongs to the Ballymore union; that for the Kilcluney district is at Clady, and is now being rebuilt; there are places of worship for Presbyterians in connection with the Synod of Ulster and the Seceding Synod, and Wesleyan Methodists. About 720 children are taught in six public schools: of these, the Cabra school, with a residence for a master and mistress, was built and endowed with £30 per ann. by the late A. McCreight, Esq. ; the present incumbent has endowed the parochial school with £20 per ann. ; and the Gosford school was built and is supported by Lady Gosford. There are also seven schools, each of which is in connection with some educational society, in which are about 240 children; and nine Sunday schools. On the estate of Lord Charlemont is a cairn, called Cairnamnhanaghan, or "the monk's cairn," a conical heap of stones still covering more than two acres, though much reduced by the peasantry, who have carried away many of the stones for building, a practice now prohibited by the proprietor. There is a similar cairn about five miles distant. Parts of the walls of the bawn built by H. Acheson, Esq., are still remaining, and in Gosford demesne are five Danish forts.